A Temporary Structure Permit is issued to anyone setting up a non-permanent structure or equipment on campus such as a tent, stage, or platform that will be used for less than 180 days. Any tent greater than 400 square feet in size or that will have more than 50 occupants and all stages and platforms shall require a temporary structure permit. The Event Coordinator must obtain permission for the use of campus space and have an approved Event Permit Application prior to submitting the Temporary Structure Permit Application. The Temporary Structure Permit Application must be submitted no later than 15 days prior to the event for tents and 10 days prior to the event for stages and platforms to allow for review and approval of the permit application. 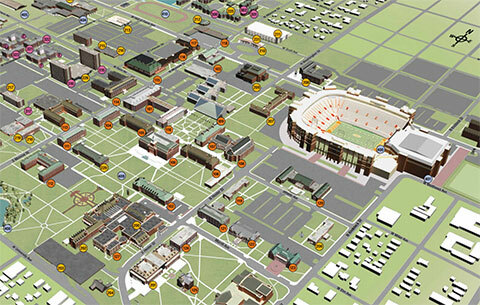 Oklahoma State University campus map indicating the location of the event. Detailed site plan, including method of tie-down and/or anchorage and location of surrounding buildings or structures. Detailed floor plan with egresses and exits shown (for tents with sidewalls and greater than 50 occupants only) and furniture/equipment arrangement. Certificate of flame resistance (for tents over 400 square feet only). Submit a Locate Request to OKIE by calling 811 or online at www.okie811.org, and submit a request through Facilities Management Customer Portal to have all utilities located and marked (for tents that require stakes to be used for anchoring only). Submit completed application to EHS (fls@okstate.edu). If the application is approved, a permit will be issued to the Event Coordinator. Additional information can be found in the Temporary Structure Permit Guide.